As I prepare for winter, sometimes I get so busy that I forget to look around at the trees all dressed in their autumn splendor. Yesterday, we had a beautiful day. The sun was warm and bright. The green grass, revived by recent rains, is beautiful. The trees are almost dripping with color and the sky is a beautiful blue. I had to pause for a few minutes, just to savor the view. Farmers around me are very busy with their fall harvest. Soy beans are being harvested as is corn and even grass for forage. I stood by the fence and watched as my animals harvest their own fall food. The lambs and steers are growing nice and fat on the lush late season grasses. The sows are enjoying wild apples and hickory nuts along with juicy clover, not to mention plump ears of corn, as they too prepare for winter. I will continue to store equipment and restore a sense of order on my farm. The animals will fill their bellies without much help from me. The farm will be harvested, the animals fattened and nourished as I go about my business. I simply need to keep water tanks filled, pastures rotated and momma pigs looked after. The horses and I continue to gather firewood as we all enjoy the cool, colorful days of autumn. Soon, the cold wet, rainy days of late fall, will bring down the leaves and mud will also be present. The cold will penetrate a jacket and all of us critters will find warm places to huddle. I know those days are coming, but for now we will all enjoy the fleeting warm sunny days that nature is providing. It is important to look around, linger a little as I go about the business of animal husbandry and enjoy the color of autumn. 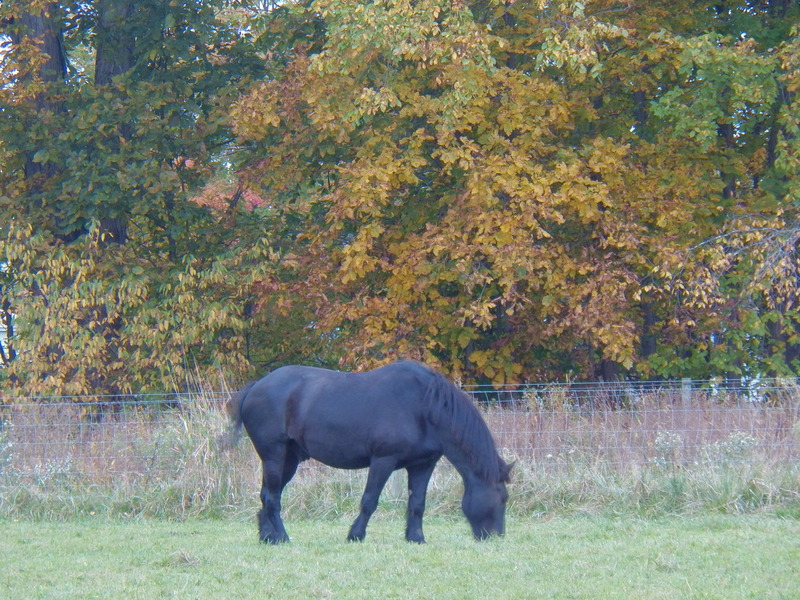 Love how the Hoss’s black coat stands out against the Fall colors! He’s such a beast! I’m in awe of how massive he is! Just drove by this morning and all 3 were close to the road. They are big boys! They are chunks. They make my farm life fun and even complete. To see their muscles ripple as we work, is as calming as when some folks watch the waves at a nearby beach. It’s such a good time of year. I love it when the flies are gone but I don’t have to break ice yet. I love your big Ol horses, too. You are so very right. All of us farm critters are glad that the flies are gone!